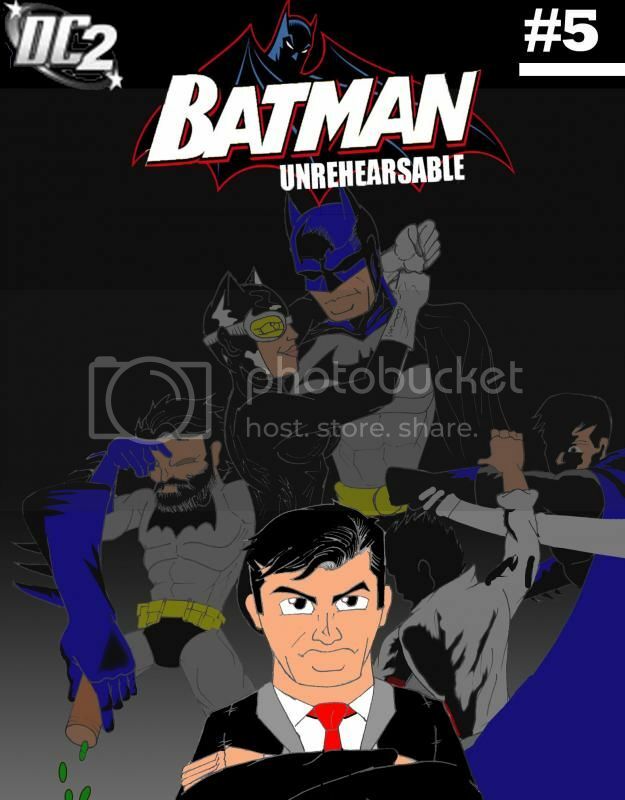 Unrehearsable #5 | DC2: New Adventures of DC's Heroes! Author’s Note: Commissioner Loeb is a canon character from Batman: Year One. Ron lit another cigarette, his second today. He’d thought he’d kicked the habit six months ago, but the events of the last few days had proven otherwise. He watched Grayson’s retreating back as the younger man moved briskly away. “Let me know if you hit any further snags,” Paxton ordered. “Call me when you have her answer.” The line went dead. Ron took a deep breath. Then he picked up the phone again and sent a two-word text to Grayson’s cell: Saturday night. Selina found Bruce in the cave, staring at the computer screen. “How’s it going?” she asked. “Were you even paying attention when he talked about it?” Selina asked with a raised eyebrow. Bruce frowned. “Non-sworns?” He felt like he should know this one, but then he’d never really paid much attention to the different category types within the GCPD. His main interactions had been with Jim and, at times, with whichever officers happened to be on-hand when he turned a collar over to them. "Police staff who don’t wear badges and aren’t classed as peace officers. In other words, civilians who work for the department. They aren’t academy-trained, and most of them get spared the polygraph, but they still get grilled. And even some non-sworns go through what you’re facing now, because if they handle evidence or other sensitive information, we need to know that they can keep their integrity intact." Bruce shot him an expression of pure horror. Bruce gave her a hard look which quickly turned to a rueful smile. “Serious enough that when you needed a place to stay after one of my old enemies threatened you—which is essentially what happened—you came to me and you’ve been staying here for a few weeks.” He reached for the glass of water behind him and took a sip. Bruce spat water over the monitor. “I beg your pardon?” He sputtered as Selina laughed. “We both will,” Selina said. Bruce took a deep breath, turned back to the screen, answered the question that he’d been looking at before and blinked. “I believe,” he said slowly, “that I may finally be done with this.” He typed the instructions quickly and submitted the file. Then he reached for the phone. “Who are you calling?” Selina asked. He ended the call looking uncharacteristically flustered. “Noted,” Bruce acknowledged, hugging Selina back. Then he turned and headed upstairs. Sitting in her monitor womb, Oracle gulped. She hadn’t meant to eavesdrop that long; she’d only been wondering how Bruce was making out with the questionnaire. “Hey, Maury,” one of the desk clerks said. Bruce followed the detective upstairs, down the hall past the commissioner’s office, and into a side office with no nameplate outside the door. There wasn’t much in the room beyond a desk, two chairs, and a machine he recognized at a glance. “I trust you have no objection to taking a polygraph?” Chiarello asked. “Not at all.” Bruce hesitated. “I know that you’re aware that they can be inaccurate,” he said. Bruce nodded and offered no resistance as Chiarello attached the tubes, placed a blood pressure cuff on his arm, and attached galvanometers to his fingers. Satisfied, he walked back to the machine and flipped a few switches. A low buzz filled the room. That brought him up short. “Why wasn’t I informed?” he demanded. Paxton slammed the phone down on the table. Then he picked it up again and hit a speed-dial button. “Ron. Have you set up a—oh, you have? Saturday evening at seven? Excellent. I’ll complete the arrangements on my end. Just make sure you have a working camera.” He hung up. “Excellent,” he whispered with just a bit less self-assurance than usual. It was still going to work out, he told himself. Everything was still on track. Bruce was in Hell. He was sure of it. One of his old foes had recognized him walking into GCPD headquarters and shot him on the spot and he was going to spend the rest of eternity answering these questions. And he’d wondered what would be left to ask after he’d completed the PHQ. Chiarello was using those as a starting point. He’d had an eventful life. He knew that. But going over it now, piece by piece, was agonizing. His natural reaction to interrogation was to stay silent and glare. Suppressing that instinct was taking its toll. He was actually relieved that Jim had convinced him not to try to fool the polygraph. With the stress he was feeling, Bruce wasn’t positive he could have pulled it off. Chiarello kept firing off questions. Bruce struggled to not sound defensive as he replied. Yes, he had been arrested four times. Twice for murder, once for treason, and once for vigilantism. True he’d been exonerated on the first three counts and found not criminally responsible on the fourth. It still didn’t sound good. He reminded himself that it wasn’t supposed to sound good; it was supposed to be truthful. “Yes.” He wondered how much remorse he should be coaxing into his voice. I suppose I COULD have bribed an officer to give me the intel I needed. It’s not like I didn’t know who the crooked cops were. “No.” Was it his imagination, or had Chiarello begun to thaw, just a little? “So would I,” said the first officer. Chiarello wasn’t thawing after all. His questions just kept coming. It was a battle of wills now. The backgrounder seemed to be waiting for him to make a misstep or tear off the electrodes and storm off in a huff. Bruce couldn’t deny he was tempted, but he was also damned if he was going to hand him that victory. “Yes. May I clarify?” He managed not to spit the words out. “Yes, but accidental or deliberate, bruises were caused.” Bruce took a deep breath. The man on the other end of the video chat nodded soberly as he ran a hand through close-cropped blond hair. “So you need someone who can cover all potential entry points,” he said, catching on. Chiarello poured himself a glass of water. “Want some?” he asked. Bruce frowned. “Myra... something. Fontaine? Fontana?” He shook his head. “I’m sorry. It was over ten years ago.” Maria Delafontaine, but that one’s really none of your business. “Yes.” And you asked me that already. “That depends on how you view the time I spent at Arkham,” Bruce replied. “I was found to be not criminally responsible for my actions; however I’m not certain whether you would consider my two years there to be punishment.” If you don’t, I may argue the point.